This nine mile section of the North Country Trail is completely on private property and features the Hammondsport area's very own Mount Washington. This Mount Washington may not be as grand as the famous one, however your steep ascent up the hill may have you wondering if you've somehow traveled to New Hampshire. 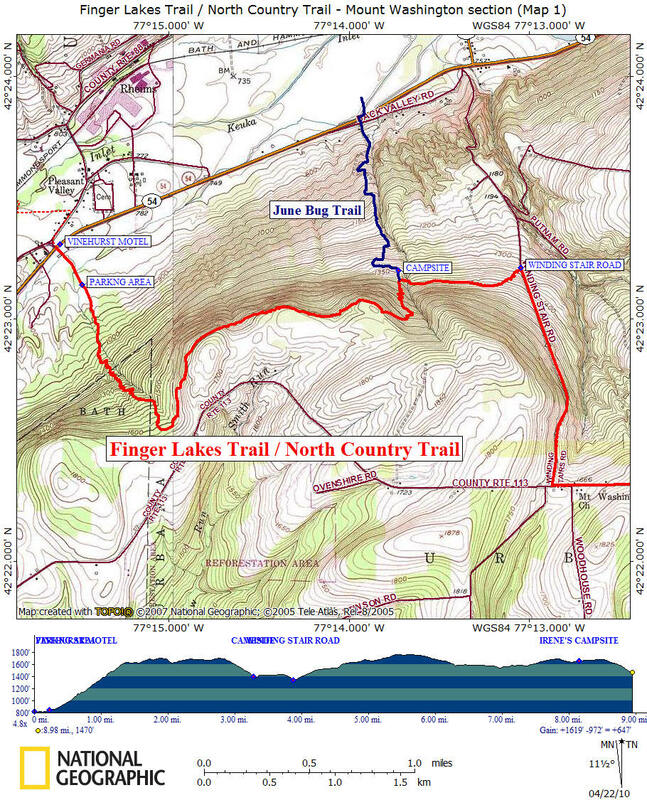 The Finger Lakes Trail coincides with the North Country Trail along this section. This section begins as the trail crosses NY 54 just south of the Vinehurst Motel. The trail follows a rough dirt road until the road veers right. The FLT/NCT follows the mowed path and your ascent begins. This whole section is located on private property. Be sure not to stray from the main trail. 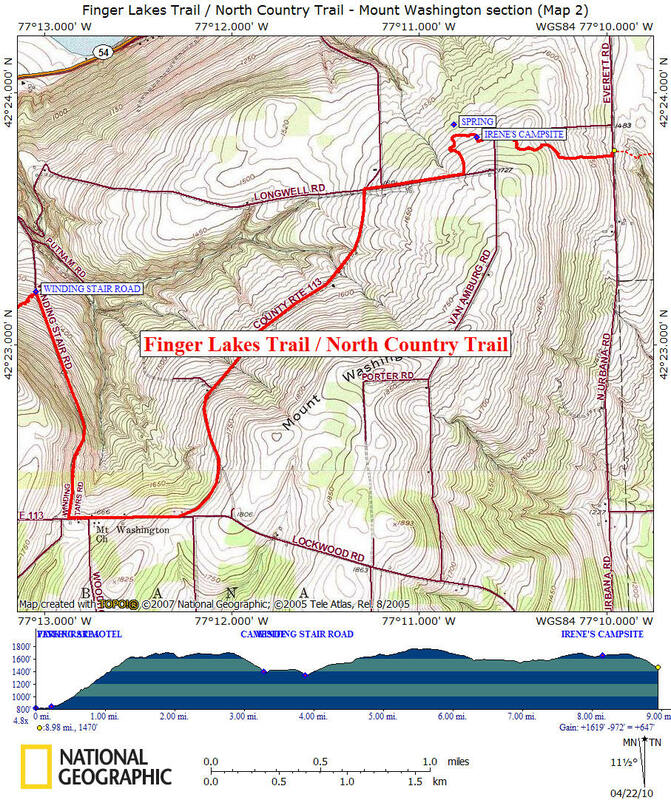 You are following white blazes, although you are on the North Country National Scenic Trail which is blazed blue everywhere except when the trail coincides with the Finger Lakes Trail. The switchbacks and trail work is a welcomed relief by the time you reach the first of the switchbacks at 0.65 miles. You've already climbed nearly 300 feet in elevation! At 0.85 miles check out the stump chair on your left. A perfect place to take a break as you still have nearly 400 feet to climb in the next 0.5 miles. When you reach a dirt driveway, the steepest parts of your ascent are over. You've climbed over 800 feet since crossing NY 54. A field is reached at 1.5 miles and a perfect place to take a break. You'll pass a radio tower just under 2.0 miles. You'll have views through the trees and winter views of Hammondsport and Keuka Lake. The best time to do this hike is when the leaves are off the trees to get the best views. At 2.8 miles the trail begins a sometimes steep descent toward the blue blazed June Bug Trail. Recent trail work in this area is visible. Be sure to watch for white blazes closely in this area. At 3.3 miles reach a trail register and the junction of the June Bug Trail. There is a campsite about 0.1 mile away on the June Bug Trail as well as an outhouse a bit further along the trail. Just past the privy is an open area with a bench (under a tree) with a partial view of Keuka Lake. The June Bug Trail descends to NY 54 and the Glenn Curtis Museum. The FLT/NCT turns right at the trail register and at 3.9 miles reaches dirt Winding Stair Road. The trail currently turns right to follow the road (no blazes) due to a sudden trail closure by a landowner. Now there is a four mile road walk to the next off road section on Longwell Road. There are views from Winding Stair Road and Longwell Road at the corner of County Route 113. The trail leaves Longwell Road on the left at 7.85 miles. There is a trail register, Bob Muller Lean To (built 2015) and then Irene's campsite at 8.2 miles. Cross dirt Van Amburg Road and descend as you make your way toward North Urbana Road at 9.0 miles. This is the end of this section. The trail turns left to follow the road briefly before turning right to enter Birdseye Hollow State Forest. Below we have a few pictures, a video, a couple of maps and a detailed description of this section of the NCT. Access Dirt Road veers right. No parking. Trail goes straight following mowed path. Start of major switchbacks up Mount Washington. Great trail work over the next 0.5 miles. Stump chair on your left. Turn left onto dirt driveway and then a quick left off driveway. Trail follows the edge of a field briefly. Trail passes by a radio tower on your right. Views through the trees at times of Hammondsport & Keuka Lake. Begin descent towards June Bug Trail. Trail Register. JCT of blue blazed June Bug Trail that leads 1.2 miles to Glenn Curtis Museum on NY 54. FLT/NCT turns right. There is a campsite plus outhouse 0.1 miles away on the June Bug Trail. No reliable water source. Reach Winding Stairs Road. Currently the FLT/NCT turns right following road (no blazes) due to a sudden trail closure. Turn left on County Route 113 aka Mount Washington - Argus Hill Road. County Route 113 veers left. Turn right on Longwood Road. Views. Turn left off road into woods. Bob Muller Lean To, trail register and soon reach Irene's Campsite. Fire pit, picnic table, privy. Cross Van Amburg Road. Parking along side of road, especially at road curve. Reach N. Urbana Road and the end of this section. Cross road diagonally and enter Birdseye Hollow State Forest.